Among the 4000 dhivya prabandham, this is the fourth 1000 pAsurams. This contains a collection of pAsurams sung by nammAzhwAr. The supreme lord kaNNan is the lord of nithyasUris and mukthAthmAs and is the most qualified to be glorified. nammAzhwAr (me) is the most qualified poet to to glorify such great SrIman nArAyaNan. This thiruvAimozhi is the most fitting prabandham to highlight the glories of emperumAn and nammAzhwAr. There is no re-birth in this samsAram for the ones who sing these 10 pAsurams of such thiruvAimozhi. 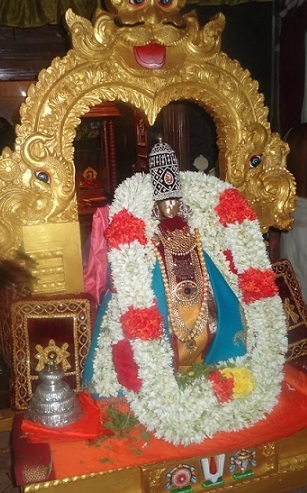 In the beginning of thiruvAimozhi itself, nammAzhwAr declares that emperumAn blessed him divine blemishless knowledge and devotion out of his own mercy. Subsequently, he establishes that emperumAn preached his own glories through the words of nammAzhwAr. Not only that, the most important 5 principles which are known as arththa panchakam is fully explained in this dhivya prabandham. This is explained beautifully in the “mikka iRai nilaiyum” thaniyan. This is why thiruvAimozhi is greatly glorified by all vaidhikas as the epitome of all literature/scriptures. piLLai lOkAchAryar compiled his most important work of SrIvachana bhUshaNam based on the principles explained in thiruvAimozhi. In AchArya hrudhayam, azhagiya maNavALa perumAL nAyanAr compares thiruvAimozhi with vEdham, vEdhAntham, ithihAsams, purANams, etc., and in the end declares that thiruvAimozhi is much greater than everything else. Similarly, he compares thiruvAimozhi and bhagavAth gIthA in detail and establishes categorically that thiruvAimozhi is much greater than gIthA as well. Thus, thiruvAimozhi is the most celebrated and comprehensive literature that is to be found in glorification of SrIman nArAyaNan, his names, forms, auspicious qualities, etc. bhagavath vishayam generally means any subject matter relating to SrIman nArAyaNan. But, in our sath sampradhAyam, bhagavath vishayam specifically means thiruvAimozhi and its meanings. SrIman nArAyaNan, out of his causeless mercy, blessed nammAzhwAr (and other AzhwArs) with divine blemishless knowledge and devotion. nammAzhwAr, after being blessed by emperumAn, explained the essence of 4 vEdhams through 4 dhivya prabhandhams. 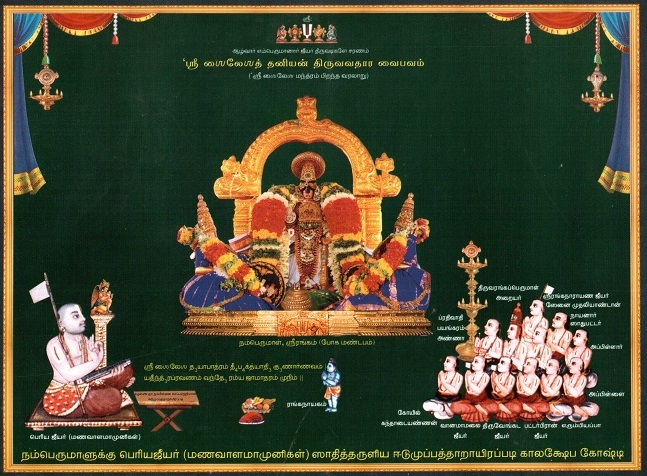 thirumangai AzhwAr presented the essence of vEdha angams (supplementary parts) through his six dhivya prabhandhams. Other AzhwArs presented the essence upa angams (additional supplementary) through their dhivya prabhandhams. emperumAnAr compiled SrIbhAshyam with the help of thiruvAimozhi to explain vEdhAntham precisely. Also, emperumAnAr ordered his dear sishya thirukkurugaippirAn piLLAn to write the first vyAkyAnam for thiruvAimozhi there by starting the tradition of writing detailed commentary for thiruvAimozhi. The essence of sAsthram is arththa panchakam, i.e., to understand the nature of the five aspects – paramAthmA (God), jIvAthmA (Soul), upAyam (means), upEyam (goal) and virOdhi (hurdle) svarUpams. This arththa panchakam is clearly explained in rahasya thrayam, i.e., thirumanthram, dhvayam and charama slOkam. dhivya prabhandhams in general and thiruvAimozhi specifically explains the arththa panchakam in a detailed manner. thiruvAimozhi also discusses the divine auspicious qualities of bhagavAn in great detail. This is why, our pUrvAchAryas spent their time fully engaged in discussing dhivya prabhandham and its meanings. 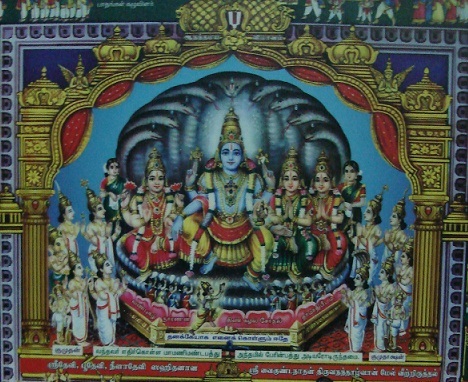 thiruvAimozhi has 5 different vyAkyAnams (commentaries). 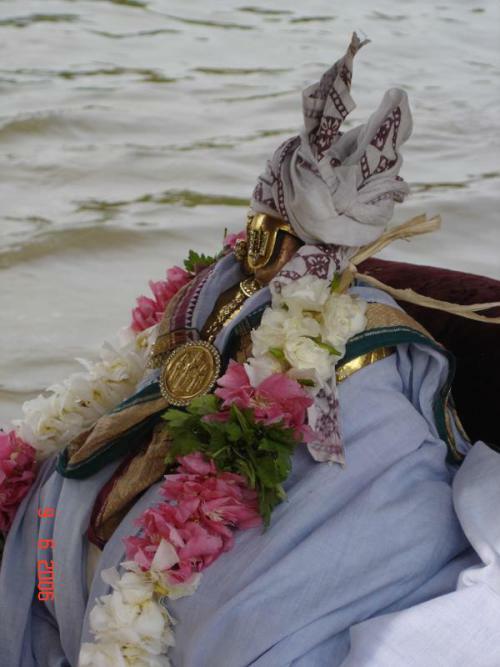 padi is a type of measurement – usually one padi means 32 aksharams (letters). There are also several arumpadha viLakkams (detailed analysis of vyAkyAnams) that are available. Of these nampiLLai‘s Idu mahA vyAkyAnam is the most comprehensive and detailed vyAkyAnam for thiruvAimozhi. nampiLLai being an expert in both samskrutham and thamizh literature, presents the views of our pUrvAchAryas in relation to sruthi, smruthi, ithihAsams/purANams, etc., in the most relishable and authoritative way. Out of bhagavAn’s divine will, nampiLLai instructs Idu mahA vyAkyAnam to be kept confidential and highlights that in the future, emperumAn himself will reveal the same to everyone through the most apt AchArya. 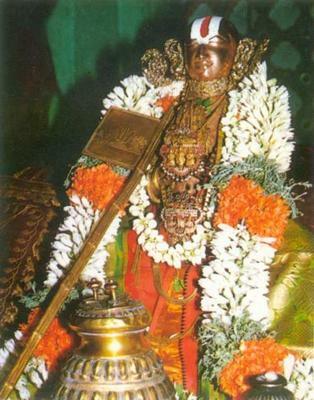 The history of Idu being transmitted from nampiLLai to mAmunigaL can be viewed at http://guruparamparai.wordpress.com/2013/04/21/eeynni-madhava-perumal/. maNavALa mAmunigaL learns the Idu mahA vyAkyAnam (and all other vyAkyAnams) through thiruvAimozhi piLLai and becomes fully attached to them. Though he was a great scholar in ubhaya vEdhAntham (samskrutham and thamizh vEdhAntham) – he fully spent his energy in rejuvenating dhivya prabandham and the various vyAkyAnams. He becomes such an expert in Idu mahA vyAkyAnam that he was famously known as “eettup perukkar” (the one who explains the divine meanings of Idu vyAkyAnam in the most detailed and precise manner). SrI ranganAthan, wanting to hear the Idu vyAkyAnam through mAmunigaL, orders mAmunigaL to lecture the divine meanings of thiruvAimozhi with its vyAkyAnams for a whole year, right in front of his main sanctum in periya kOyil (SrIrangam). mAmunigaL accepts the orders of emperumAn and delivers his lectures with great enthusiasm. He lectures the Idu vyAkyAnam mainly and explains the principles in relation to sruthi, smruthi, ithihAsams/purANams, pAnchArAthram, other vyAkyAnams of thiruvAimozhi and other dhivya prabhandhams, etc. On the most auspicious Ani thirumUlam day, he performs sARRumuRai (completion) of his kAlakshEpam. periya perumAL himself appears as a small boy and submits “SrISailESa dhayApAthram” thaniyan (a verse of glorification) to mAmunigaL and accepts him as his own AchArya. From then onwards, the glories of bhagavath vishaya (Idu) kAlakshEpam becomes well established and the same has been carried out by our sath sampradhAya AchAryas regularly. Thus, we have seen the glories of thiruvAimozhi, Idu mahA vyAkyAnam and mAmunigaL. emperumAn has great love for all 3 of them and thus he himself heard the thiruvAimozhi vyAkyAnam through mAmunigaL in periya kOyil (SrIrangam). It is also common practice to explain thiruppallANdu and kaNNinuN chiRuth thAmbu vyAkyAnams before explaining thiruvAimozhi. mAmunigaL highlights in upadhEsa raththina mAlai that “vEdhaththukku Om ennumathu pOl” – just like praNavam (OmkAra) is the essence of vEdham and is thus recited at the beginning of any vEdha pArAyaNam, thiruppallANdu highlights the identity of jIvAthmA and paramAthmA. So, thriuppallANdu is explained first to understand the sambandha gyAnam (knowledge about the relationship between jIvAthmA and paramAthmA). mAmunigaL highlights in upadhEsa raththina mAlai that “vAyththa thirumanthiraththin maththimamAm padham pOl” – just like the “nama:” which explains the upAyam and is in the middle of thirumanthram, kaNNinuN chiRuth thAmbu explains the upAya gyAnam (knowledge about the means to reach emperumAn) and is explained next. nArAyaNAya sabdham in thirumanthram explains the auspicious qualities of bhagavAn and kainkaryam. thiruvAimozhi is filled with narration of bhagavAn‘s auspicious qualities – every paththu (centum) is focussed on a particular quality of emperumAn, every padhigam (decad) is focussed on a particular quality of emperumAn and even every pAsuram is focussed on a particular quality of emperumAn. So, thiruvAimozhi explains the upEya gyAnam (knowledge about the ultimate goal – performing eternal kainkaryam after being overwhelmed with the auspicious qualities of bhagavAn). Thus thiruvAimozhi is explained in the end. Thus, one needs to study thiruppallANdu, kaNNinuN chiRuth thAmbu and thiruvAimozhi to get a full understanding of the important principles of our sath sampradhAyam. 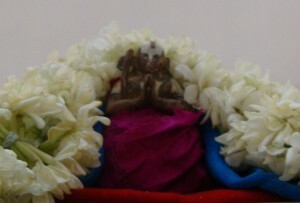 vyAkyAnam for thaniyans have been provided by piLLai lOkam jIyar. Many recent-time vidhwAns such as kAnchIpuram SrI u. vE prathivAdhi bhayankaram aNNangarAchAryar swamy have given wonderful and simple explanations for thiruvAimozhi pAsurams based on pUrvAchAryas‘ vyAkyAnams. SrImAn purushOththama nAidu swamy has also given very simple/elegant thamizh translation for eedu vyAkyAnam. With the help of all of these and the mercy of emperumAn, AzhwArs, AchAryas and asmadhAchAryan, we will see the English translation for this wonderful dhivya prabandham. In our translation, we will see the word-by-word meaning from vAdhi kEsari azhagiya maNavALa jIyar‘s 12000 padi commentary and highlights from other vyAkyAnams wherever applicable/possible. Wonderful beginning. Pray unto the lotus feet of divya dhampathis to guide dEvarIr in completing the task successfully. it sounds very nice sarathy swamy.are you giving vyakhyanam also? if so it s really wonderful task.may acharya krupa help you. Thanks for the feedback/encouragement. Yes, we will be providing highlights from vyAkyAnams (but not full translation of the vyAkyAnam). not yet – in the future we will try. DEAR SIR, I HAVE VIEWED YOUR E-MAIL WHICH IS POSTED , THANK YOU SIR, AND I AM EXPECTING MORE AND MORE INOFOS OF OUR SHRIVAISHNAVA IYENGAR COMMUNITY’S CULTURE,CUSTOMS ETC., IN THE EARLIEST TIMES IN A GRAND GALA OPENINGS SIR. ADIEN…. Shall be highly thankful and possible a small request from adiyen is that in the English work either at the beginning or at the end the pasuram in Tamil is included to have more clarity like my poor guys who do not know how to read the pasuram.. I feel the urge of learning all the 4000 and odd pasurams( being in Tamil and myself being a Tamilian) at my present age of 62. WHY THIS URGE DID NOT COME WHEN I WAS YOUNG, ALL His will only.Your work is divine and is valuable for years to come. emperumAn’s grace is always there. But it materializes when we stop stopping his grace from reaching us. Anyway, it is great that now you have developed the taste. Hope you read and enjoy the available devotional literature regularly. Yes swami, kindly include pasuram in tamizh also please. Adiyen srica Dasan. Adiyen is so fortunate to get access to your works. When are you planning to post PDFs of 6th to 10th centum of Thiruvaimozhi. Looking forward eagerly to them. Currently adiyen is translating 6.8. We have e-books (PDF files) upto 6.7. We will be preparing e-books as and when we complete the translation. Really excellent work. Very much useful and better bay to taste the sweetness of thiruvaimozhi. Thank you for your contribution, Looking eagerly for the rest of centums. The links to the translations are not working. For example the translation to the first centum link and other translations as well. Appreciate your help in making them work. Seems to be working for me. Please check again – sometimes there may have been website issues. Let me know if you need further assistance by sending a mail to koyil.org@gmail.com .